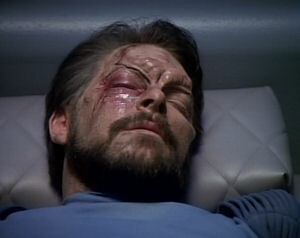 Commander Riker is injured and taken to an alien hospital during preparations for a first contact mission. When the doctors discover that Riker isn't one of them, it threatens to derail the entire process. It's uncommon to see things from the aliens' point-of-view. "29 hours a day." Nice touch. It's fun how everything in the alien culture is similar to our own modern times, but slightly off-kilter. Everything Mirasta says to Picard about what's likely to happen is correct. Events transpire almost exactly as she predicts. Riker is remarkably cool under pressure. Picard shares his wine with the Chancellor, which is in keeping with his brother's request to "never drink it alone" (as seen in "Family"). The scenes between the Chancellor and Picard contain some really well-written dialogue. I can't imagine them being easy to get right. I absolutely love the stuff with Bebe Neuwirth. "I've always wanted to make love to an alien." That explains her interest in Frasier. This is a really neat episode full of some clever writing. I like the whole Roswell-mythos-in-reverse thing, and I like how the writers are able to explore some standard sci-fi tropes from a different point of view. Picard talks about "disastrous first contact" between humans and Klingons, but that's not what we see in ENT when Klingons and humans first meet.